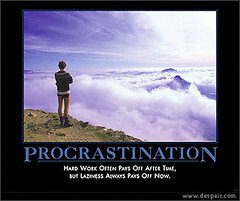 Can You Fall In Love With Procrastination – Should You? “Many time management experts label procrastination in strictly negative terms such as ‘the thief of time.’ But is procrastination always such a negative experience? Is there a positive side to procrastination, one that may even encourage you to procrastinate more often? ← Is Self Improvement Necessary To Win At Life?